thousands of candidates each year. Contracting is becoming more and more popular among professionals. 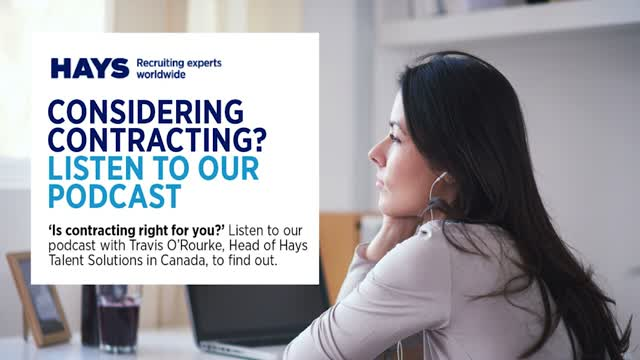 In this episode Travis O’Rourke, Head of Hays Talent Solutions in Canada, discusses how you can determine if contracting is the right career path for you. Register for the What Workers Want webinar for essential recommendations on how to be a more effective employer of IT professionals, making you better able to retain and attract the talent you need. LinkedIn’s EMEA HR Director, Lisa Finnegan, will discuss how LinkedIn has created a purpose-led culture, the various factors that contribute this and how this improves retention and attracts talent. We explored the priorities of over 13,650 professionals across a broad range of professions and sectors including almost 550 permanent IT professionals to find out what motivates them at work every day and what would encourage them to move to another organisation such as yours.